T minus 6 days and counting until Thanksgiving and the un-official start of the Christmas season. I say "un-official" because if it were up to Lowe's, Target, the local town center stores and Michael's to name a few, Christmas would begin revving up in September. Each year I try and plan ahead so December is actually a season of peace and calm. Some years I succeed, some, not so much. This year, I decided to make some Christmas dough and freeze it so when the mood strikes, the cookies will be halfway done. 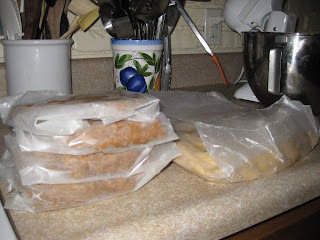 I chose two doughs that can be premade, my #1 all-time favorite Peanut Butter Kisses and our recent favorite addition, Spicy Gingerbread (and by "spicy" I mean ginger, cinnamon, nutmeg, not cayenne and hot peppers) and whipped them up when the boys were away at preschool. The gingerbread is in smaller, easier to roll out batches, the peanut butter in one big hunk of ooey gooey goodness. Which begs the question...are you a dough eater? I know, I know, we aren't supposed to eat raw dough, but I know many chronic dough snatchers...are you one? Wow, I wish I could do dough but I don't. I am, however, getting prepared for Xmas. Just picked out my settings and napkins today. Menu is almost finalized AND I have been picking up little treats for the last few weeks to give away in baskets. So much fun!!!!!! I am such a dough eater. Yummy!!!! 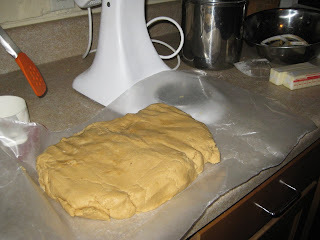 love the idea of preppring dough beforehand - particularly as i am 38 weeks prego! the peanut butter kiss link is taking me to the sugar cookie recipe - is that right? thanks!! I think it's a brilliant idea to freeze dough in batches and to destress oneself especially festive season and a family to care for. Commonly people will stress themselves to make and bake for the festive those days but it's gone now. Everyone now seems to just pick-up ready made cookies from the store and stalls (it happens to where I live). It seems like a distant memory, but years ago I relished making involved, gourmet meals. 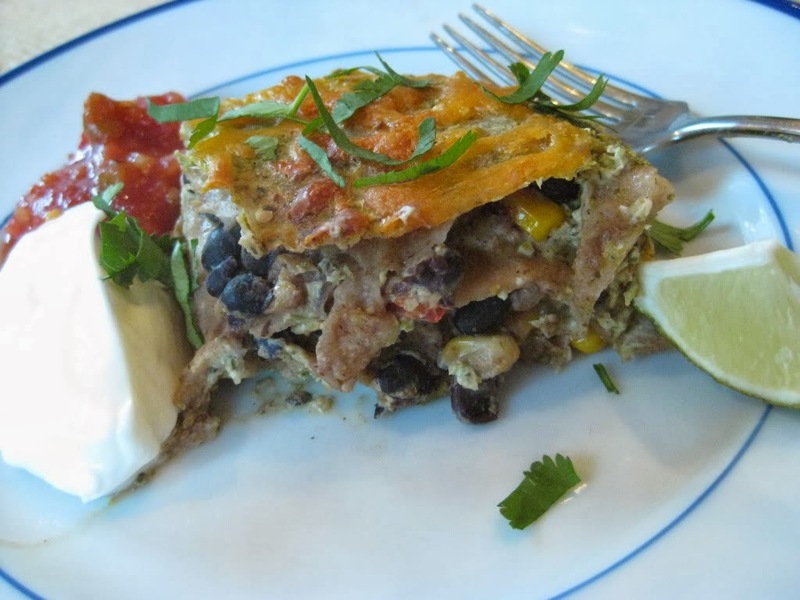 Now my goal is to create healthy meals that appeal both to me and my husband and the palates of my two Sweet Pea boys. Journey with me through my victories and defeats. Black Beans + Beets + Ground Chicken = Meatloaf?